Hope you saved room for desert. 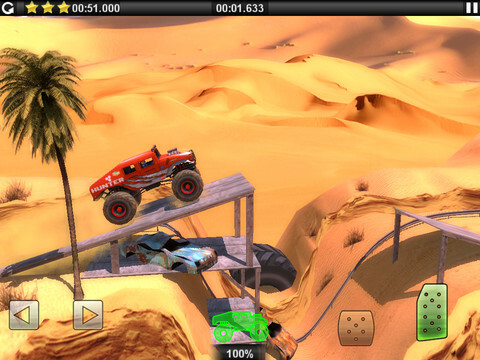 Earlier this year, we applauded Dogbyte Games' enjoyable physics-powered title, Offroad Legends. The satisfying mix of monster trucks, pretty environments and tricky single-player challenges earned it a deserving spot in our rotation. Now comes another entry, Offroad Legends Sahara. Although it falls short of the sequel we still wish and hope for, this free-to-play expansion does two things well: it gives fans more content, and newcomers a taste of vehicular mayhem. As the title implies, this Offroad Legends game takes place in the desert. That said, you can expect plenty of sand, mountains and cacti dotting the landscape. Despite this change of scenery, though, the basic goals remain the same. Through careful balancing of the left and right arrows, you must quickly drive from point A to point B (or complete some other objective) in the fastest time possible. At first, the most obvious solution appears to involve pressing down on the accelerator the whole way through, but this tactic quickly proves useless. The spot on physics, combined with a series of hills and ramps, mean you need to maintain momentum without the truck tipping over, or crashing rear/hood first. 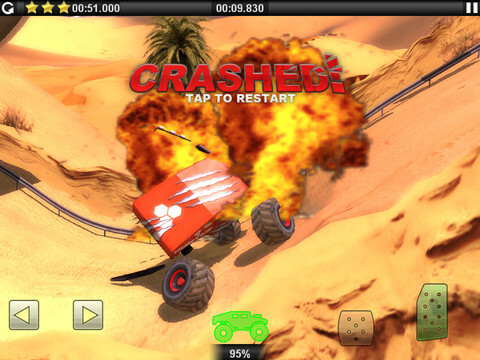 The game features real-time damage, so it's possible to lose some wheels following a nasty spill, forcing you to restart. It doesn't help that the developers throw lava beds and landmines onto the tracks. What ensues is more simulation than arcade style gameplay. Sometimes you master a course after an untold number of attempts, while other times, you succeed through sheer luck. It all comes down to how you work the gas, brake and those aforementioned arrows. On that note, don't expect much from Sahara. This is merely a vehicle to ferry users to the more fully featured Offroad Legends game, which costs a reasonable $0.99 to download. As such, you'll find just four different vehicles in the free version (an ice cream truck made the list), and eight stages to master. Not exactly content rich, but that's the point. Ultimately, you get to play this expansion free of charge, and if you like what's here (and you should), a dollar gets you the full shebang. Offroad Legends Sahara doesn't pack enough content to last even a weekend, but for a couple hours, it satisfies. What's Hot: New desert-themed stages, excellent physics, much tougher than it seems, sharp-looking visuals, vehicular damage. What's Not: Only eight tracks and four vehicles.